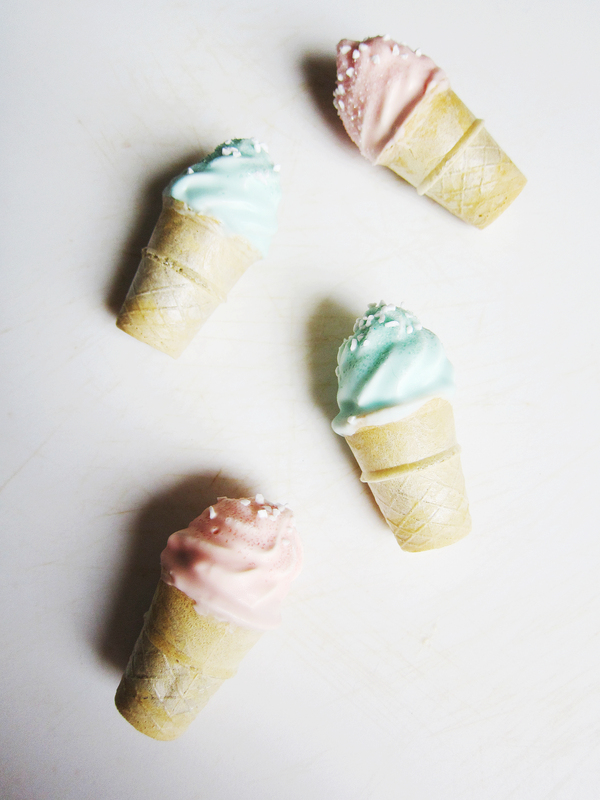 The weather is finally starting to warm up and these ice cream cones were screaming to be used. I originally used them for my ice cream cone macarons, but I had half a box that was sitting on my counter looking useless and forlorn. 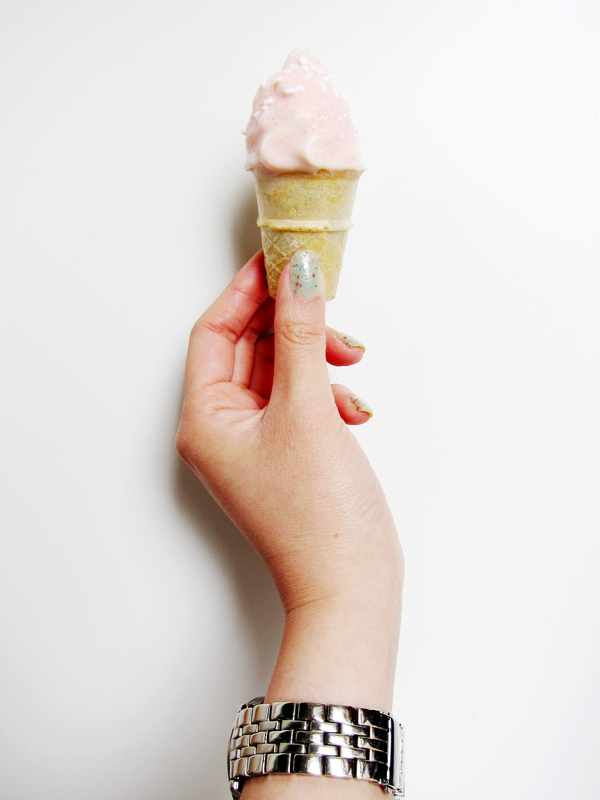 I wanted my next post to be hi hat cupcakes, so I stuffed it into a cone. It’s ridiculously fun and easy to eat. The crisp chocolate coating breaks into the soft marshmallow frosting and rich chocolate cake. You can also sprinkle it with different combinations of toppings and change the color of the candy melts to suit the occasion. I used Swedish pearl sugar and sanding sugar as toppings, but you can use anything you want to top it. It also looks very cute with sprinkles. On another note, why is the weather cloudy 80% of the time I’m trying to shoot photos? Can’t a sista catch a break once in a while? Every time I start conjuring up an idea for a project, the forecast is bound to be cloudy or rainy. If you are into photography, you know the value of natural light and can understand my frustration. If you’re not, then please excuse this rant of mine. 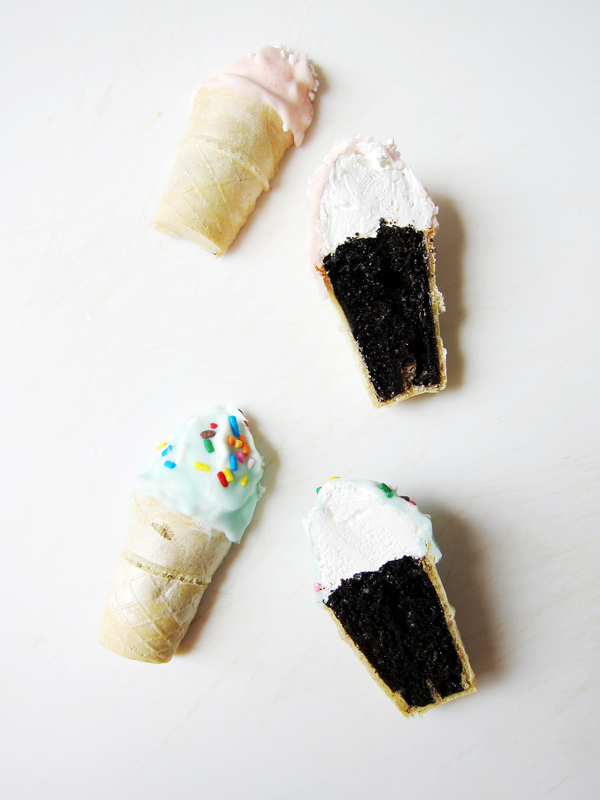 Preheat oven to 350 degrees and put one mini ice cream cone in each cup of a mini cupcake pan. Let stand for 5-10 minutes when done, then put onto a cooling rack to fully cooled. In a small pot fill about 1 in. of water and let it come to a simmer. In the bowl of a stand mixer, whisk egg whites, sugar, cream of tartar and salt until homogenous. Once the water comes to a simmer, place the bowl on top of the pot and whisk the egg white mixture until the sugar is completely dissolved and no longer grainy. Move the bowl to your standing mixer fitted with a whisk attachment and beat on high speed until glossy and stiff. Add the vanilla extract and mix completely. Fill a piping bag fitted with an open star tip. Pipe a swirl of frosting onto cooled cake cone. Put into the freezer for 15-30 minutes until completely cold. In two separate bowls, melt white and pink candy melts and blue and white candy melts. Remove the cake cones from the freezer and dip the frosting portion into the melted chocolate. Do not be afraid, the frosting will not fall off if sufficiently cooled. Before the chocolate sets, sprinkle sanding sugar and Swedish pearl sugar. Let chocolate set and enjoy. * The toothpick test: insert a toothpick into the cake and if the toothpick comes out clean or with a few crumbs clinging to it, it is done. This entry was posted in Cakes, Chocolate, cupcakes, Desserts, Ice Cream and tagged Cake, chocolate, cupcake, dessert, Ice Cream. Bookmark the permalink. I love these, what a brilliant idea. I know what I’m making for my next get-together! Thank you! 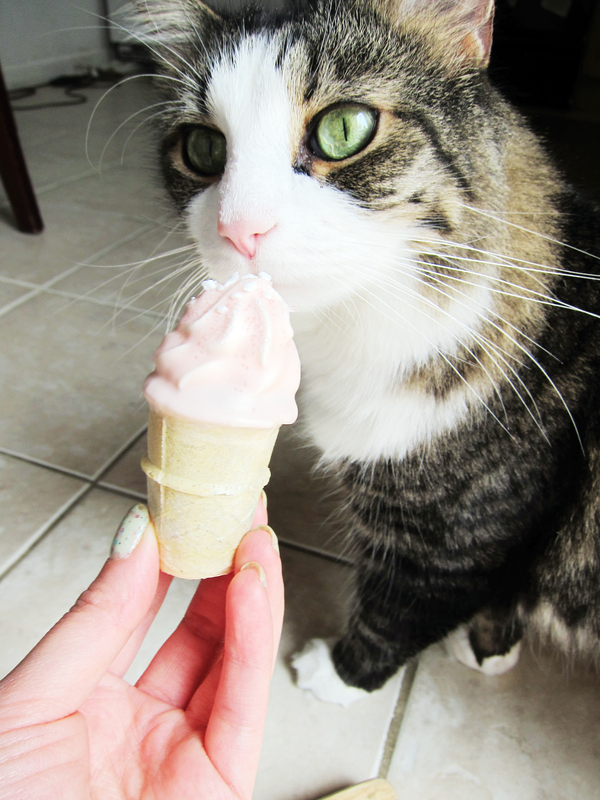 You’re too sweet!! I think I’m out of blogs to nominate right now :X I’ll definitely keep this in mind though!